The first comprehensive guidance for companies about how to meet their responsibility to respect the human rights to water and sanitation was launched today by the United Nations Global Compact’s CEO Water Mandate – a public-private initiative designed to assist companies in the development, implementation and disclosure of water sustainability policies and practices – at UN-Water’s 2015 Annual International Zaragoza Conference on “Water and Sustainable Development: From Vision to Action.” The beta version of the Guidance for Companies on Respecting the Human Rights to Water and Sanitation: Bringing a Human Rights Lens to Corporate Water Stewardship will help companies translate their responsibility to respect the human rights to water and sanitation into their existing water management policies, practices, and company cultures. Launched in 2007 by the UN Secretary-General, the CEO Water Mandate is overseen by the UN Global Compact, a strategic policy initiative for businesses that are committed to aligning their operations and strategies with ten universally accepted principles in the areas of human rights, labour, environment and anti-corruption, and implemented in partnership with the Pacific Institute. The guidance, developed by the CEO Water Mandate and Shift, a leading center of practice on implementation of the UN Guiding Principles, aims to provide companies with practical measures on how to bring a human rights lens to their existing corporate water stewardship practices. Its development was informed not only by project partners with expertise in water resources and human rights, but also by business representatives, civil society organizations, and UN agencies. With the formal recognition of the human right to water and sanitation in 2010 by the UN General Assembly and the Human Rights Council, and the adoption of the UN Guiding Principles on Business and Human Rights in 2011, there are increasing expectations that companies align their water management practices with their responsibility to respect human rights. 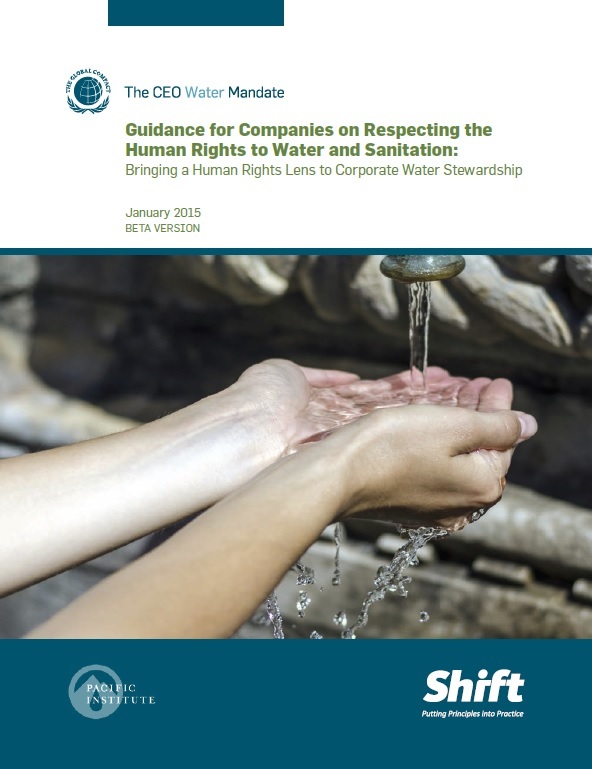 The Guidance for Companies on Respecting the Human Rights to Water and Sanitation is designed to be applicable to a broad range of corporate water users, and underscores the important nature of effective stakeholder engagement throughout the process. “This guidance provides real-world examples and feasible steps for companies to help them understand and take action on the impact their operations have on peoples’ access to water and sanitation. Water and sanitation are crucial issues to both the environment and human rights and this guidance provides companies with a way to take their existing water and sanitation programs and broaden or adapt them in order to meet their responsibility to respect the rights,” said Rachel Davis, Managing Director of Shift. Companies have increasingly recognized their water practices have environmental impacts; they are now beginning to focus on understanding how their practices impact human rights. In response, businesses can look to the guidance to provide step-by-step direction for their responsibility to respect human rights via the key procedural elements of the UN Guiding Principles. Shift is an independent, non-profit center for business and human rights practice. It is staffed by a team that was centrally involved in shaping and writing the UN Guiding Principles on Business and Human Rights, and is chaired by the author of the Guiding Principles, Professor John Ruggie.